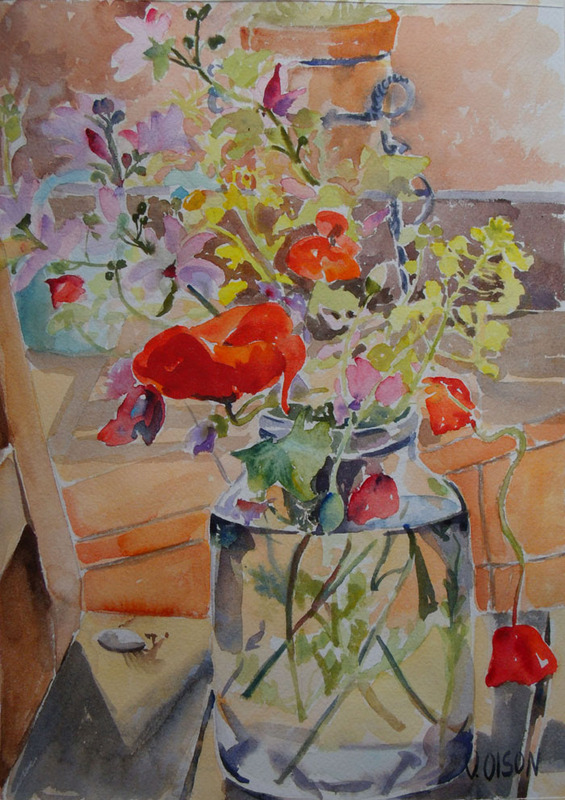 The poppy and wild flower season has ended for the year. I’ve been busy painting because I know how short this season is. When these flowers dry up in the fields, they are a fire hazard in the city, so they were all cut close to the ground last week. I wasn’t able to do very many, but I’ll be posting the watercolors I was able to do. 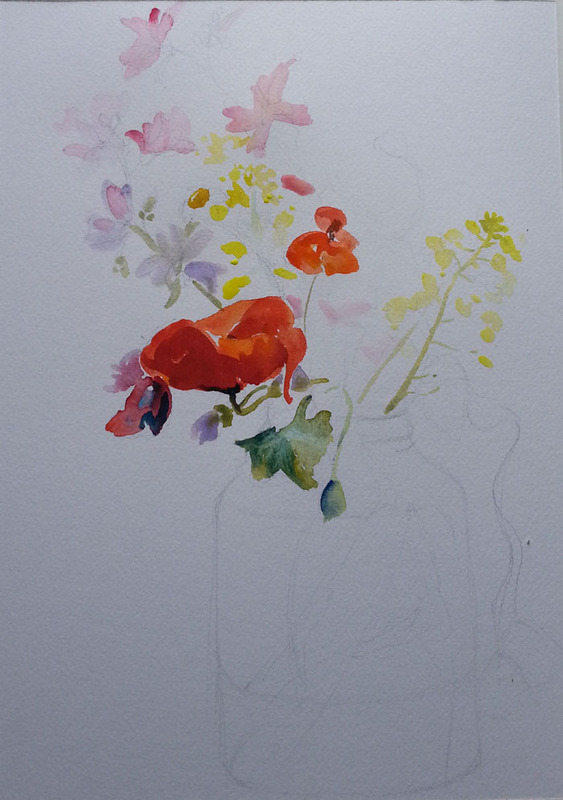 What I like most about painting these flowers is the combination of colors. I usually start out with my favorite part and build up around it. I penciled in the jar lightly to keep parallel lines parallel to the edge of the paper. I use the poppy as a measurement to see how everything else fits on the picture plane. Once I have everything in place, I try to do it boldly in one shot to keep it fresh. Poppies – we don’t get too many of them in my neighborhood, but I associate them with May. Lovely work! Es fresca la acuarela en su parte inferior pero pesada en la parte superior. El bote de cristal y las ramas de las flores en el agua tiene una buena lectura, pero las flores se confunden con el fondo y no se aprecian. De todas formas el conjunto es bonito. Gracias por darme algo en que pensar sobre lo que pinto. Lo aprecio mucho. Thanks Sand Salt Moon! All the poppies are gone now. These last couple of months have been like a painting marathon for me. ha, ha. 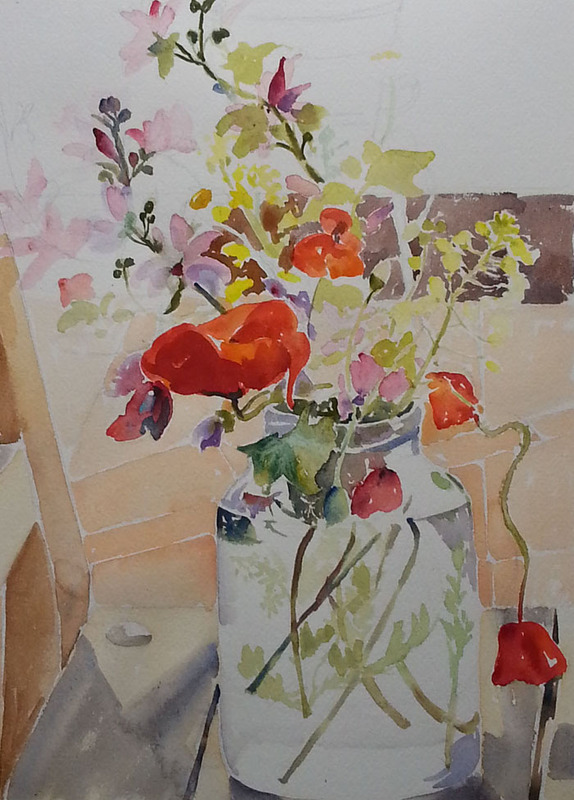 Your painting is lovely….I love how the poppy leads the eye into the rest of the painting. And I always admire your glass work! Thank you Create Art Every Day! I think I’ll do some city paintings next. 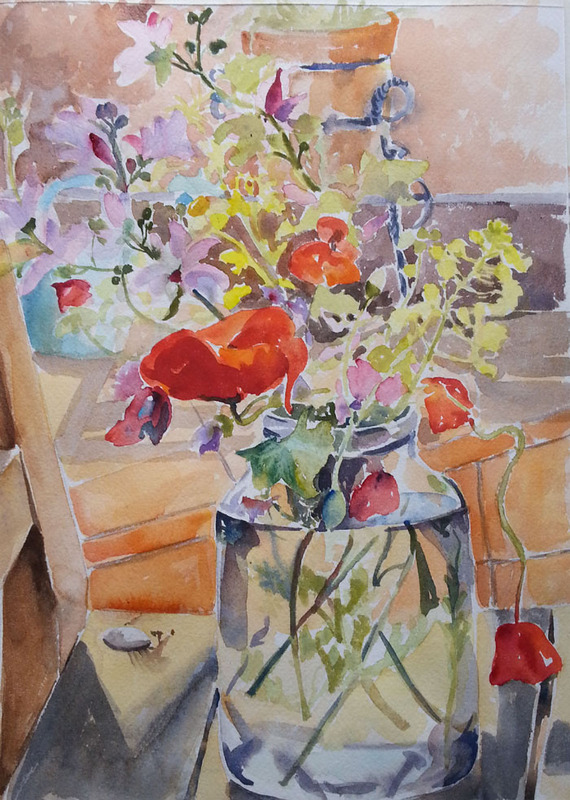 I took a short break after the wild flower season and started painting with tempera. Tempera takes a long time to do, but I like it too. One day I’ll start posting my tempera paintings too.